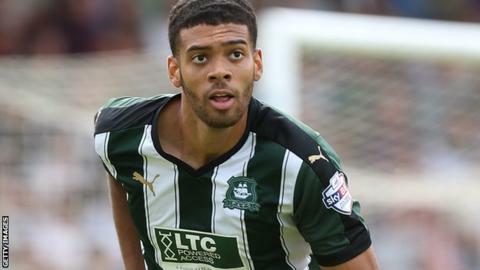 Striker Jake Jervis scored his seventh goal of the season as Plymouth Argyle came from behind to beat Barnet and move up to second in League Two. The Bees took the lead when Curtis Weston teed up Aaron McLean to fire past Argyle keeper Luke McCormick. Graham Carey levelled with his fifth goal of the season, powerfully guiding the ball in from the edge of the box. But Argyle sealed victory on the hour when Gregg Wylde ran down the wing and found Jervis, who hooked the ball in. "I thought we played very very well as a team, I thought tonight was a superb performance. "It's very frustrating not to come away with anything, and once again our team has played so well, played with such spirit, played with such quality and completely nullified the opposition. "How we have lost that game, I'll never know." Match ends, Plymouth Argyle 2, Barnet 1. Second Half ends, Plymouth Argyle 2, Barnet 1. Mauro Vilhete (Barnet) hits the bar with a right footed shot from the left side of the box. Attempt blocked. Curtis Weston (Barnet) right footed shot from outside the box is blocked. Attempt missed. Tom Champion (Barnet) right footed shot from outside the box is just a bit too high. Attempt missed. Michael Nelson (Barnet) header from the centre of the box is too high. Attempt missed. Craig Tanner (Plymouth Argyle) left footed shot from a difficult angle and long range on the right is close, but misses to the left. Substitution, Plymouth Argyle. Craig Tanner replaces Graham Carey because of an injury. Substitution, Plymouth Argyle. Oscar Threlkeld replaces Reuben Reid. Mauro Vilhete (Barnet) wins a free kick on the right wing. Delay in match Graham Carey (Plymouth Argyle) because of an injury. Delay in match Gary Sawyer (Plymouth Argyle) because of an injury. Goal! Plymouth Argyle 2, Barnet 1. Jake Jervis (Plymouth Argyle) left footed shot from the centre of the box to the top right corner. Assisted by Gregg Wylde. Attempt missed. Gregg Wylde (Plymouth Argyle) left footed shot from outside the box is close, but misses to the left. Corner, Barnet. Conceded by Kelvin Mellor. Hiram Boateng (Plymouth Argyle) wins a free kick on the right wing. Goal! Plymouth Argyle 1, Barnet 1. Graham Carey (Plymouth Argyle) left footed shot from outside the box to the top left corner. Assisted by Reuben Reid. Attempt missed. Michael Gash (Barnet) right footed shot from the centre of the box is close, but misses to the left. Attempt saved. Mauro Vilhete (Barnet) right footed shot from the left side of the box is saved in the bottom right corner.